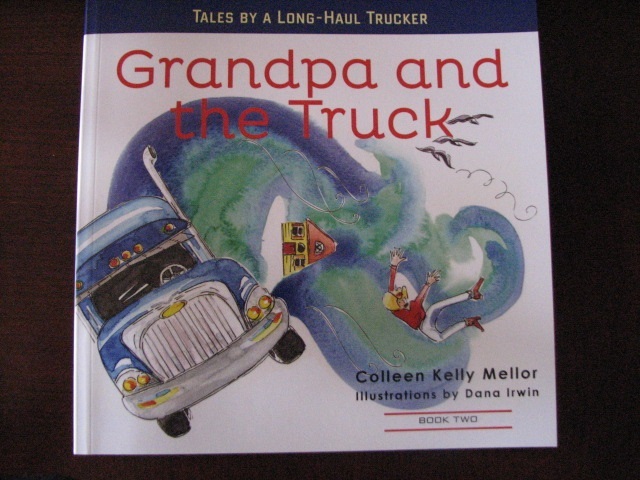 “Grandpa and the Truck”…Coming Soon…. | Biddy Bytes: "Where Am I?" “Grandpa and the Truck”…Coming Soon…. So, you’re not a Facebook fan (and don’t even lnow how it operates,) but link below will show how grandpaandthetruck.com is featured (with color illustrations) on that site..If you like, you can check off “Like” and that helps me get the word out there. So, here’s the link, go visit, check off “Like” (if you do). Then come back to read the rest of how I got into this crazy business…. The book ranks are filled with them—the latest heroes and heroines in the childrens’ literature world, but to tell the truth: I’m perplexed by the fact truckers haven’t figured prominently in the ranks. Why? In transporting goods across the country, they compete against nature’s challenges (hurricanes, snow, ice, fog), driver fatigue, bad road conditions (those West Virginia mountain roads are killers), crazy drivers, etc. Quite simply, there are no greater heroes in the American Success Story than truckers. Don’t believe me? Look around your home. Every item’s been transported, at some point or another, by a trucker. 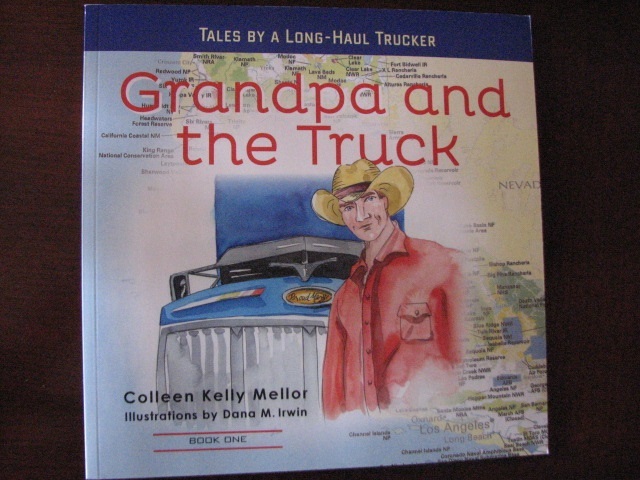 This past winter I worked feverishly to produce the first stories in my series of childrens’ books called “Grandpa and the Truck,” about my husband’s 30-year career as long-haul trucker, moving households across America. In January, I began, in earnest, to identify my illustrator. It had to be someone who could capture my husband’s personality, his rakish good humor, his implacable drive (pun intended) to complete whatever he began. I found her in Asheville, North Carolina. We’ve been working weekly, ever since. Book 1, containing the first two stories, is almost complete, and I’m seeing my vision come together—literally—before my eyes. The website grandpaandthetruck.com is up (with help from a tech person I hired) whereby folks can come in, look about, and see what the series entails. Why am I excited? The books are wonderful! (Yeah, I know…I’m biased.) Maps allow children to track the truck in each story as it heads across America,, giving them an other-than-GPS knowledge of geography. The stories reflect historical events (Woodstock Music Festival…remember, Grandparents? ), nature’s fury in the form of hurricanes, snow, fog, and ice, or they demonstrate our country’s regional diversity (Grandpa was born on the edge of a cotton field, a Southern boy who later moved to that tiny coastal state– Rhode Island). They all teach important life lessons. Why is teaching kids important to me? I taught young people in classrooms for 30 years. As such, I wanted to create a product that would entertain and inform. The “Grandpa and the Truck” series delivers…on all counts. With these stories, a trucker’s child can know what Dad or Mom do every day, and truckers, themselves, will revisit scenes that have played often in their own careers. The age group’s 4-8, but big ‘kids’ will like them, too, as you’ll see. Finally, the “Grandpa and the Truck” stories pay tribute to the men and women who do that difficult job every day (yes, many women now drive the big rigs, as you’ll see in story #3 “Girl Truckers”). For that reason, truckers are real American heroes… not the fictional kind. This tribute is long overdue. In the meantime, Biddy Bytes will still run–just on altered schedule. Got to cut back now that I’m running both sites. Hope you’re all on board for the exciting days ahead…. This entry was posted in Careers, Family Life, Inspirational, Work Place and tagged big rig drivers, kids stories about truckers, truckers, trucking, women trucking. Bookmark the permalink.